The Cairns Esplanade curves itself around the CBD shoreline and is a super popular spot to hang for out anyone who loves the great outdoors. BBQs are dotted in easily accessible spots where you can laze and graze under the palms, there’s the huuuuge lagoon complete with sandy beaches, fountains, shallow spots for the small kids, all looking out over the Coral Sea. There’s also a skate park, bike paths and entertainment in the evenings. Active Living classes are on throughout the day, so if you ever wanted to try your moves to Aqua Zumba or Yogalates, this is the moment you’ve been waiting for! Did we mention it’s entirely free? Fitzroy Island is definitely the family favourite of all the islands here in the north, not least for being dubbed the best beach in Australia. In addition to its white sand and azure water for days, Fitzroy nails the activity list - double kayak tours, a massive ocean trampoline, glass-bottom boat trips, scenic hikes to rainforest peaks. 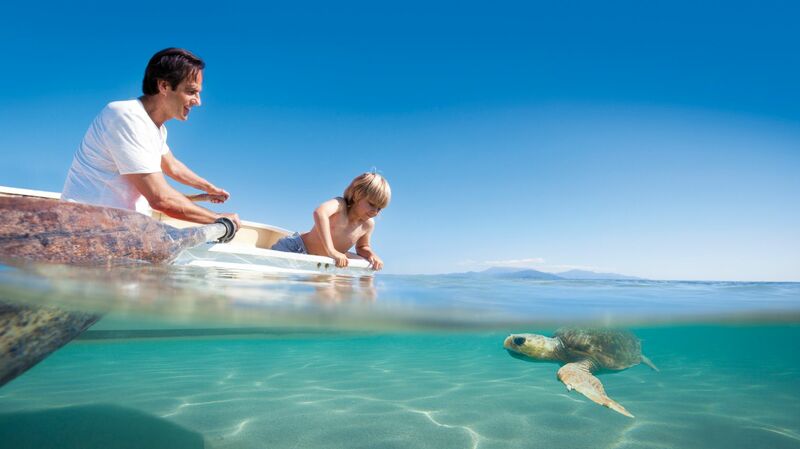 Kids can find Nemo AND Dory, check out the turtle rehabilitation centre and snorkel until the sun goes down. Accommodation is available, but day trippers are most welcome. Get a bird's eye view from the tops of the trees with the Skyrail Rainforest Cableway. Buckle up in a gondola that ascends mountain through layers of rainforest canopy, stopping twice along the way at Red Peak and Barron Falls station, where you can see, hear, smell and learn all about the inner workings of our magical rainforests. Back on board the gondolas and you’ll glide gracefully over the mighty Barron Falls before arriving at the final stop, Kuranda, the whimsical and other-worldly mountain village that perches high above Cairns. Have you been to Tropical North Queensland? What are your tips for a family-friendly holiday that makes everyone smile?